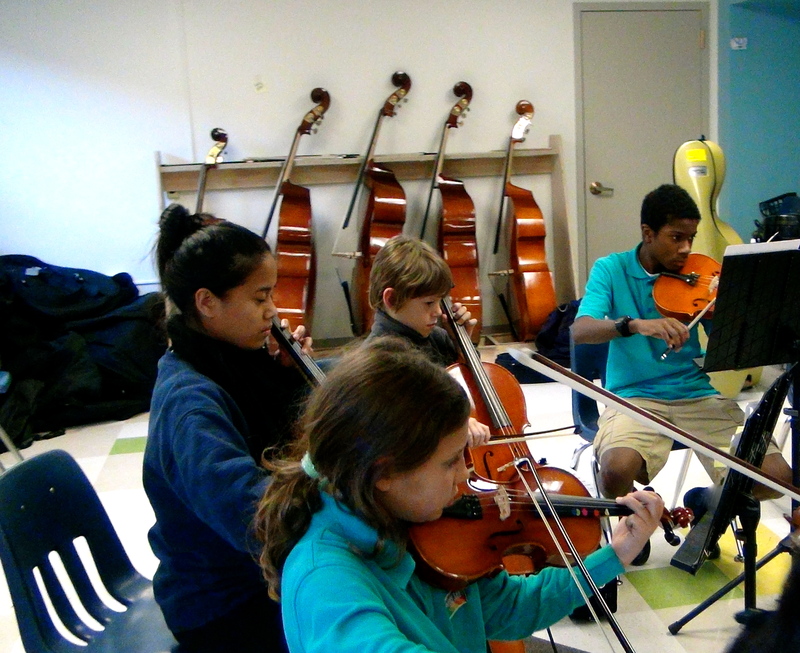 This post is Part 2 of a three-part series about From the Top’s Fall 2014 residency at the Conservatory Lab Charter School (CLCS), an elementary school in Boston with a music-intensive curriculum. Read Part 1 here. 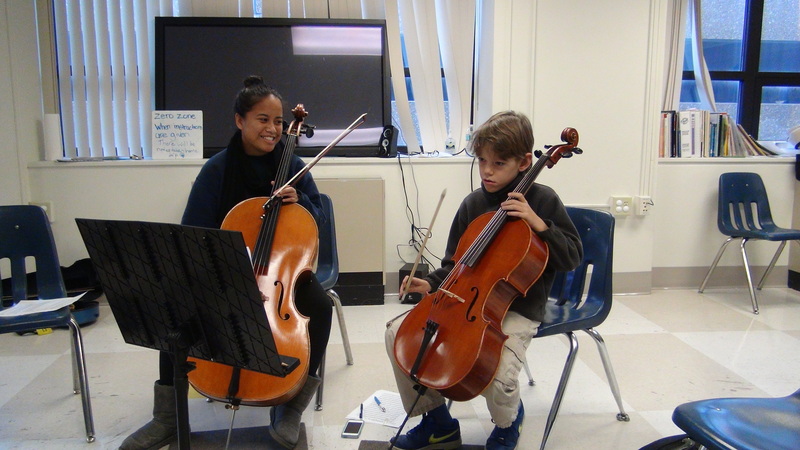 On a windy fall afternoon, From the Top’s arts leaders arrived for the second day of their chamber music residency at Conservatory Lab Charter School (CLCS). On their shoulders, they carried their high school backpacks while in their hands they carried their instrument cases. 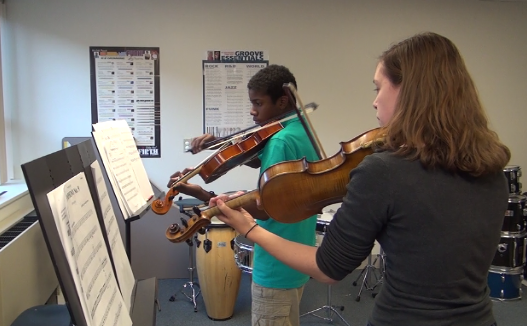 Stepping through the school doors, these young musicians were going from being students to being teachers, a transition that was beginning to feel more comfortable with each day. There were only five days to prepare the younger CLCS students for their performance before the school community, and they were all up for the challenge. Today, getting acquainted felt a little easier, more productive, and more fun. 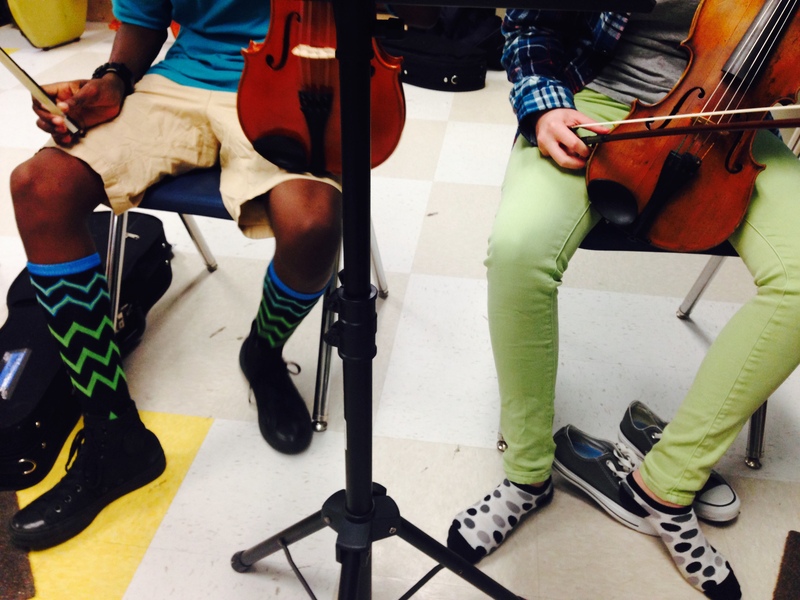 CLCS student violist Chavez’s very colorful socks became a topic of discussion and connection between him and his coach Claire. For each of the four pairs of teachers and students, the differences in age were starting to melt away. They were getting to know each other by connecting through every day life topics, and building their relationships by playing music together. The arts leaders’ plan for the day was to explore communication through music with their mentees. Teaching the CLCS musicians how to cue and communicate while playing together in a chamber group was the name of the game. Sitting in a circle, instruments lifted, it was time for the arts leaders to demonstrate this for the younger students. After watching their mentors, it was their turn to try it out for themselves. With some trepidation, the group looked around the circle at each other, lifted their instruments, breathed together, and began to play. With some newfound confidence and skills to communicate, they moved their bodies and instruments connecting with each other throughout the rest of the piece. They were really starting to sound like an ensemble! “The group of kids were amazing and always ready to learn and try new things,” said arts leader Julia Churchill. After running through the piece ­– as a group, the arts leaders then broke off into pairs to work individually with their respective students. 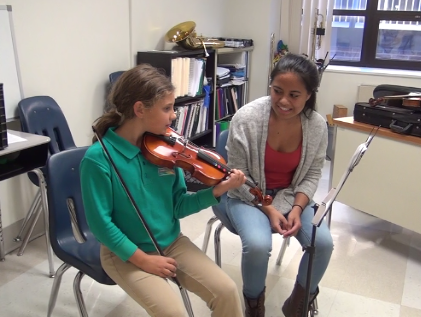 It was during this one-on–one work when the relationships between the older and younger students really blossomed; the safe place where they found new ways to connect with music and each other. “The one-on-one time worked really well. 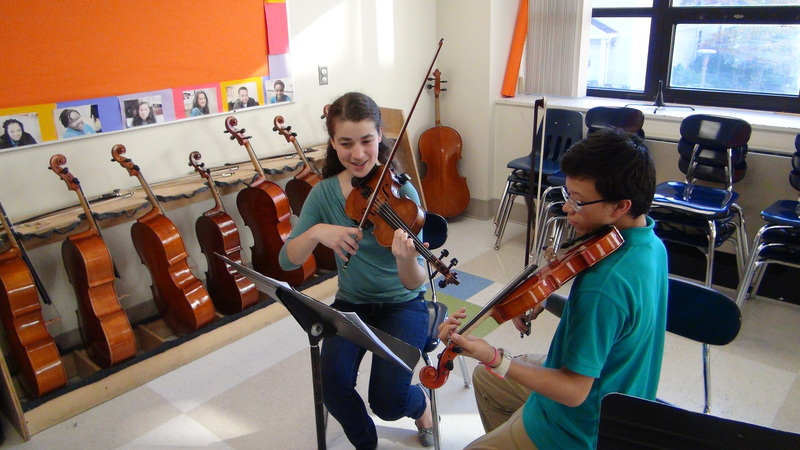 That is where I noticed the students were most comfortable and responsive,” Emma said. “My biggest takeaway was seeing Chavez open up, relax, and smile,” Claire said. After the individual lessons, everyone came back together to run through the music again. It was evident that they had learned a great deal in a short amount of time and the great work they had done in their small groups began to impact the sound and dynamic of the group as a whole. Everyone played as a chamber group, cuing and communicating with their eyes and as they played through the piece together. Notes, intonation, and rhythm had also made significant improvements. As the young musicians put their instruments down, there was excitement in the air. They knew how far they had come. Though there was still much work to be done, the day ended with anticipation and excitement for the things they would accomplish in the next four days. Based on the development of these young musicians thus far, how do you think cueing in music mirrors the relationships and connections we make in real life? Stay tuned for Part 3 of this series for the conclusion and overview of From the Top’s residency at the Conservatory Lab Charter School.